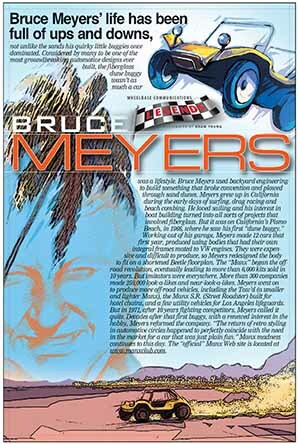 Bruce Meyers’ life has been full of ups and downs, not unlike the sands his quirky little buggies once dominated. Considered by many to be one of the most groundbreaking automotive designs ever built, the fiberglass dune buggy wasn’t as much a car was a lifestyle. Bruce Meyers used backyard engineering to build something that broke convention and plowed through sand dunes. 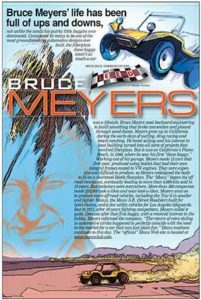 Meyers grew up in California during the early days of surfing, drag racing and beach combing.